Two photos taken on the same day and site in late September. Top, on the edge of a patch cut, with colorful foliage and abundant seeds. Bottom, in adjacent mature stand with green foliage and few seeds. Description: A large, multi-stemmed large shrub or small tree. 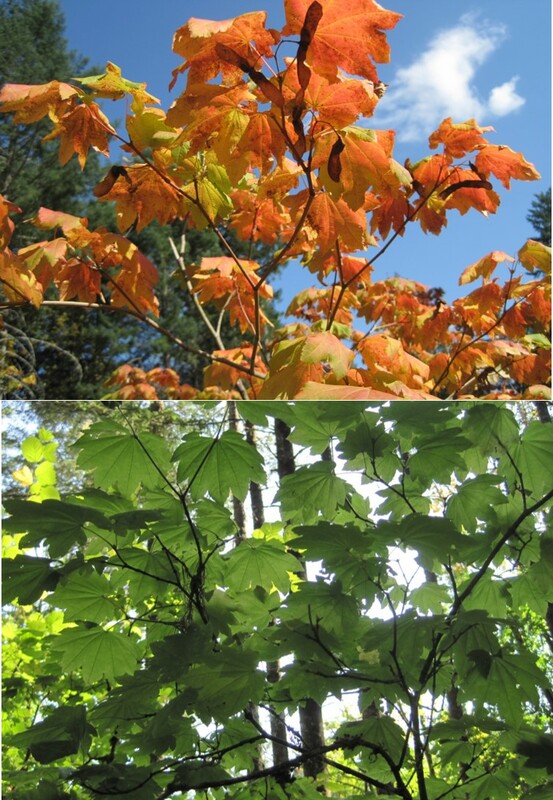 Like all maples, leaves are lobed like a fan or the palm of your hand (“palmate”) and in opposite arrangement on the branch; seeds are in winged pairs (“samaras”). The bark is smooth and greenish. 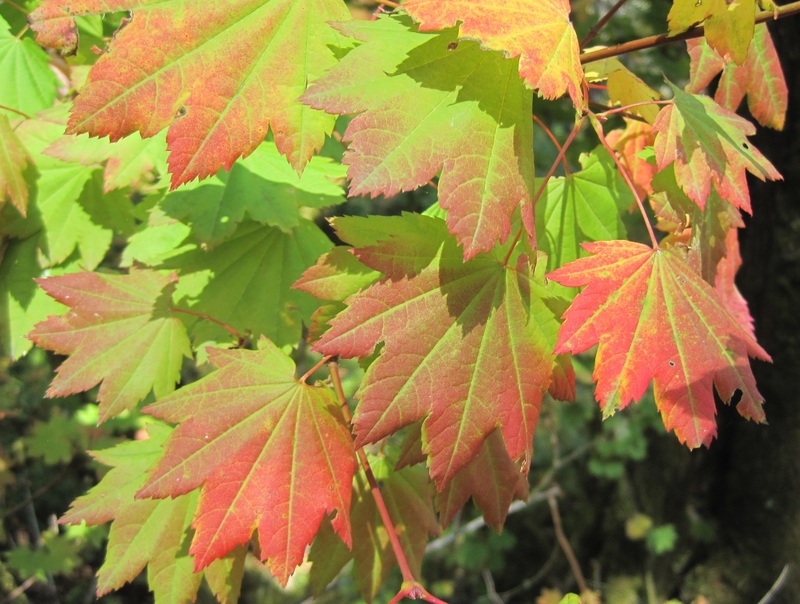 Vine maple grows on moist sites in sun or shade, in regenerating to mature forests. In sun, its habit is denser and erect; seed production is more abundant, and leaves turn orange to red in fall. In a shady understory, it lives up to its name, with long spindly stems that arch to the ground and re-root upon contact. Fall foliage is less brilliant in the shade, and fewer seeds are produced. Wildlife value: Vine maple is considered a preferred and nutritious summer forage for deer and elk. Elk continue to browse the twigs and buds in winter. Squirrels will cache the seeds for winter feeding. In open regenerating (i.e. early seral) areas, songbirds rely on deciduous shrubs such as vine maple for nesting cover and will forage for insects that feed on the foliage. Management considerations: Vine maple is considered a “good shrub to leave behind”, or carry over from one timber rotation to the next to support early seral associated songbirds. Doing so, acknowledge that you’ll have to grant it a little real estate as it won’t play too well with little neighboring conifer seedlings. You don’t need a lot to make a difference. Leaving vine maple along the edges of patch cuts or in clumps with other retained shrubs reduces interference with planted trees. In mature stands, vine maple will fill in the understory after thinning or disturbances allow light to filter through the canopy, providing a food resource and cover for deer and elk. Uchytil, R. 1989. Acer circinatum. Woodland Fish & Wildlife. 2014. Managing for Deer and Elk on Small Woodlands.